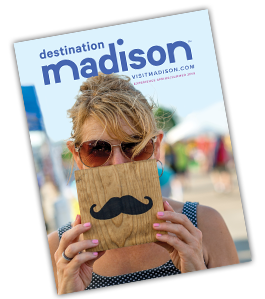 Greater Madison plays host to hundreds of fabulous stores, from locally owned boutiques to major malls. No matter the reason or the season, it&apos;s easy to plan a "shop &apos;til you drop" weekend here! A Room of One&apos;s Own Bookstore—A 6,000-square-foot new and used indie bookstore. Little Luxuries—A great place for unique gifts and accessories. Madison Museum of Contemporary Art—Visit the gift shop inside the museum to find items for audiences of all ages. University Book Store—Books, gifts, and gear for Wisconsin Badgers fans. Bavaria Sausage—Authentic, old world German sausages made in Madison for more than 50 years. Chocolaterian Cafe—An unforgettable dessert and chocolate experience; home of Christine&apos;s Toffee & Caramels. Ehlenbach&apos;s Cheese Chalet—A Swiss chalet in DeForest that features more than 100 different Wisconsin cheeses plus sausages and other gourmet foods to give as gifts. Fromagination—A specialty cheese shop celebrating Wisconsin artisanal cheesemakers and imaginative pairings with artisan breads, fine wines and charcuterie. Gail Ambrosius Chocolatier—Fine chocolates made by hand and sold in Gail&apos;s Atwood Avenue store, Metcalfe&apos;s Market, and online. Columbus Antique Mall and Museum—Wisconsin&apos;s largest antique mall, with more than 78,000 square feet of antiques. Duluth Trading Co.—Hardworking clothing items for women and men found in Mt. Horeb, WI. Odana Antiques—Madison&apos;s largest antique center featuring styles from Art Deco to Mid-Century to Victorian and every era in-between. Orange Tree Imports—An incredible combination of culinary delights, specialty food and gifts located in Madison&apos;s Monroe Street neighborhood for more than 40 years. Greenway Station—An "outdoor mall" with more than 35 retailers that collectively create a shopping and dining experience. Hilldale Shopping Center—Recently expanded to include many new stores, such as Lush, Sur La Table, Apple, and Lucky Brand. East Towne Mall—Located less than a mile from I-90/94 and contains three major department stores, more than 75 specialty shops, and 16 restaurants and eateries. West Towne Mall—More than 120 different stores to choose from, including many restaurants. Outlets at the Dells also offers 30-70% off retail prices at favorite brands such as Nike, Under Armour and Disney and is located just off I-90/94 in the Dells. Downtown—Some of Madison’s most eclectic shops are located right in the heart of downtown. More than 350 shops, galleries, and boutiques, eaters, and more make downtown a diverse shopping experience with something for everyone.